Happy Thursday and Happy Halloween! Shellye here to share a layout using the brand new collection from Simple Stories, "Daily Grind". The colors and design of this collection are perfect for both boy and girl projects...and you'll be introduced to a new element called "Bits & Pieces". "Daily Grind" is loaded with chevron patterns. For my layout I chose a couple of different colors and cut apart the red one to create a fun border! I then layered on dot patterned paper and a 6X8 speech bubble journal card. I used different areas of the speech bubbles as a background for my photos. My daughter attends dance two days a week and often has special engagements on Saturdays. I pulled the handy days-of-the-week journal tags from the "Bits & Pieces" pack and clustered them with a photo. A few stickers from the Fundamentals Cardstock Sticker sheet, alphabet stickers and chipboard stickers completed the page, along with several brads. You will love how well Daily Grind works with any of your daily, everyday photos, as well as Life Documented projects! If you like making your own calendar or organzier, this collection will serve as a wonderful tool! Back to the Daily Grind, but we love it! Happy Hump Day...yay we are half way through the week. Guiseppa here and I have something to get you through that Daily Grind (no pun intended). 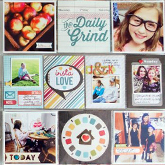 I am loving the new collection Daily Grind, it's just perfect for those everyday scrapbooking moments. I love the time I have to spend with my family and Daily Grind helped me to capture that moment perfectly. These are the people I love and I happy they are part of my Daily Grind. They make it all worth it. How about a card. This collection has a ton of fun saying that come with it, making it perfect to create fun cards. Now, I would love to share with you a layout I made using one of the new Sn@p Sets...Him! Whatever you are creating, Simple Stories has a collection that will work for you. Thanks for stopping by and I hope you have enjoyed my projects using Daily Grind. Happy Tuesday to all you Life Documented fans out there! Nichol here today to share a new Life Documented page spread featuring the brand new Daily Grind collection! And because I struggle keeping my supplies limited to just one of Simple Stories amazing collections, I threw in some of the newest Sn@p! Sets embellishments and journaling cards as well! In fact, that's one of my favorite things about the Simple Stories Collections: how well they mix and match with each other! I loved the look of the large oversize monogams on the days of the week journaling cards in Daily Grind and used those as the focus on the journaling portion of my layout. Not only do these cards serve as a place to add the journaling but they help your eye move across the page spread and add interest and "embellishment" throughout the design. I used a 4x6 card in my "title" pocket and the 3x4 heart card from the Everyday Sn@p! Set. I'm using the Simple Stories Faux Leather 12x12 album in Green for my Life Documented pages. I used the Sn@p! Pocket Pages in Design 6 and Design 3. Want to keep up to date on all of the current and future Daily Grind projects? It's easy; simply follow us on our Daily Grind Pinterest board! Introducing Our Newest Release - Daily Grind! Happy Monday morning! Layle with you today. I'm super excited to share with you our newest release - Daily Grind! Document your ‘day to day’ with Daily Grind by Simple Stories! Classic wood grains paired with a playful combination of vibrant colors and iconic symbols make Daily Grind your ‘go to’ collection for highlighting the routine - day after day, week after week, & year after year. Bits & Pieces are individial die cut pieces - perfect for cards, layouts, Life Documented pocket page scrapbooking, and all of your paper crafting projects! These brads are so fun! Between the brad clock and the spinner (yes, the spinner actually spins! ), I don't know which ones I love the most! Our 3x4 cards arent just for Life Documented spreads, they make super easy cards as well! Daily Grind coordinates with all of our SN@P! Binders & Albums, especially the red and orange! I just love these 3x4 and 4x6 SN@P! cards - days of the week & months of the year - YES PLEASE! How about a Daily Grind Giveaway! So, do you love it?!! We hope you do. We'd love to hear what you think - leave a comment here on this post and/or on our Facebook page to be entered to win one of two Daily Grind goodie packs! We'll leave comments open until Saturday, November 2nd and announce the lucky winners on the 3rd. Good luck! Daily Grind begins shipping to retailers mid November! Welcome to the Simple Stories & 3L Blog Hop! We’re so excited to team up with Scrapbook Adhesives by 3L and use their amazing line of adhesives to share some inspiring projects with you this week. Scrapbook Adhesives by 3L is also posting projects using Simple Stories products this week, so be sure to head over to their blog and check it out! For my project today, I decided that I wanted to start my daughter's baby book.... one month from today, she will be 6 years old... so I guess I better start now! The best part about starting this project with 6 years worth of photos, I will be able to get it done in a Sn@p! I used the new Baby Girl Sn@p! products to add to my pretty pink faux leather album and sure enough, this project started to come together quickly. For today, I wanted to focus on photos of my daughter's first birthday. The cool thing about Sn@p! is that you don't have to work in order. I love the ease of moving my photos around with the pocket pages. I used my adhesive runner from Scrapbook Adhesives by 3L to glue a photo of my daughter to the back of one of the 4x6 Sn@p! cards. I also used the 3d foam squares (my favorite!!!) to pop up some stickers and give a little dimension to my album. I love that I don't have to worry about adding more photos as I print them. The albums, pocket pages, and Sn@p! cards make scrapbooking a fun & easy process when you have a lot of photos to put into an album (for me, there was no other options with the 6 years worth of photos). Thanks for joining us this week for the Simple Stories & Scrapbook Adhesives by 3L Blog Hop! Happy Friday! Tonya here with you today. Welcome to the Simple Stories & 3L Blog Hop! We’re so excited to team up with Scrapbook Adhesives by 3L and use their amazing line of adhesives to share some inspiring projects with you this week. Scrapbook Adhesived by 3L is also posting projects using Simple Stories products this week, so be sure to head over to their blog and check it out! For my layout I used one of the brand new SN@P! Sets Love. My husband and I just celebrated our 20th wedding anniversary this summer and this set was perfect for this photo and layout. I used the EZ Runner to adhere the photo, 3x4 card, and the die cut card to my base page before I stitched around the edges. To adhere the pocket to the layout I used Crafty Power Tape, I knew that I wasn't going to sew around the edges of the pocket so I wanted to use an adhesive with some staying power! The above die cut came from the Say Cheese collection and was originally a beige color. I really wanted it to be black so I used some black mist on it to change the color. To pop up many of those die cut hearts that are floating out of the pocket I used the 3D Foam Squares. Once again I used 3D Foam Squares to pop up that little camera sticker. Leave us a comment on what you like about 3L adhesives and we’ll draw a random lucky winner at the end of a week for a fun prize from Scrapbook Adhesives by 3L! Thanks for joining us today for the Simple Stories & Scrapbook Adhesives by 3L Blog Hop. Check back with us tomorrow for more inspiration using 3L products! Hey there! Vicki here with day 4 of the Simple Stories and Scrapbook Adhesives By 3L Blog Hop!! We are so excited to team up with Scrapbook Adhesives By 3L and use their amazing line of adhesives to create some inspiring projects this week. The team from Scrapbook Adhesives By 3L are also posting amazing projects on their blog using Simple Stories products. Make sure to check it out HERE. I have been a long time user and huge fan of the products offered by Scrapbook Adhesives By 3L. Their E-Z Runner, Dodz and 3D Foam Squares are my go to adhesives! I especially love their Photo Corners which come in White, Kraft, Black, Ivory, Silver and Gold. I used the star diecut page from the Smarty Pants SN@P! pages as a mat and mixed a number of the SN@P! Him elements on my page for my son Riley. This one came together quickly and I LOVE it! Note how the 3D Foam Adhesive really makes the circles pop and adds dimension. These are one of my can not live without tools...LOVE my 3D Foam Adhesive!!! The art work on the SN@P! cards becomes great "diecut" shapes by simply cutting them out. Here are some metallic embellishments I made from the small black 3D Foam Adhesive squares. Just add silver foil to one of the sticky sides of the square. Thanks for letting me share my project with you today! Leave us a comment on what you like about 3L adhesives and we’ll draw a random lucky winner at the end of a week for a fun prize from 3L! Thanks for joining us today for the Simple Stories & 3L Blog Hop. Check back with us tomorrow for more inspiration using 3L products! Hello, everyone! Melissa here today to welcome you to the Simple Stories & 3L Blog Hop! We’re so excited to team up with 3L and use their amazing line of adhesives to share some inspiring projects with you this week. 3L is also posting projects using Simple Stories products this week, so be sure to head over to their blog and check it out! 3L produces two of my very favorite adhesive products, and one of them is key to getting the journaling printed on my cards! I'll share more on that in a minute, but first I want to start things off with a look at my Life Documented layout using the new Everyday Sn@p set. I'm often asked how I print on my journaling cards, and I've actually filmed a video showing how if you're interested in learning more. One thing that's crucial to the process is a good temporary adhesive, and my favorite choice for that is the Repositionable Dots EZ Runner by Scrapbook Adhesives. It lets me temporarily adhere the journaling cards to a carrier sheet to run through the printer, and the adhesive is easy to simply brush off with my fingers before slipping the finished card into a Pocket Page. I also love 3L's 3D Foam Squares, especially the thinner ones. They're great for making your own layered embellishments, and the thinner squares let you add just a bit of dimension to a Life Documented layout without having to worry about the page getting too bulky. You can see in the photo below how I used the foam squares along with stickers from the Sn@p sets and circles punched from scraps of Simple Stories paper to make a pair of fast and easy layered embellishments. The supplies for this particular Life Documented layout include my trusty 12x12 Sn@p Faux Leather Album in Teal along with Design 3 Pocket Pages (I use the same design every week just to make my life easier! ), and of course stickers and journaling cards from the Everyday Sn@p Set. Hi everyone, it's Natasja here today :) Welcome to the Simple Stories & 3L Bolg Hop! We're so excited to team up with 3L and use their amazing line of adhesives to share some inspiring projects with you this week. 3L is also posting projects using Simple Stories products this week, so be sure to head over to their blog and check it out! I would like to share with you a mini album I made using the I [HEART} summer line including pictures from a fun family daytrip. The great thing with the Simple Stories lines is that a lot; the cardstock and chipboard stickers, decorative brads, layered stickers and flair icons, are self adhesive! But, we always need adhiseve to add our pictures, pieces of papers and other things. The great thing about this MyStik is that you can easily aply it in curves, exactly what I needed to glue down the torn patterned paper on the cover. The Crafty Power Tape was perfect to add the cocktail Stirrer. Thanks for joining us today for the Simple Stories & 3L Blog Hop. Leave us a comment on what you like about 3L Adhesives and we'll draw a random lucky winner at the end of this week for a fun prize from 3L! Check back with us tomorrow for more inspiration using 3L products. Hi all! Kay here. Welcome to the Simple Stories & 3L Blog Hop! We’re so excited to team up with 3L and use their amazing line of adhesives to share some inspiring projects with you this week. 3L is also posting projects using Simple Stories products this week, so be sure to head over to their blog and check it out! This week I used the new Family set. I thought the line was perfect with all of the family events we had these two weeks. I also went with a fall theme and supplemented with some stickers from the Harvest Lane line. For adhesives I used the E- Dots Mini Permanent dispenser. LOVE the ease of use! Another 3L favorite of mine are the 3-D Foam Squares. I love the little bit of dimension they give my projects! I kept both weeks simple, as time is a little lacking right now. But this set helped me SO MUCH in terms of pulling together a cohesive look with a minimum of time or fuss. That's the ticket for me! As always, this is the Faux Leather Album I use and love. And another secret I have for keeping up with documenting your life on a regular basis is consistency on pocket pages. I use the same three designs which helps me when taking pictures. I know I will have pictures that will fit these pages, which takes all of the guesswork out when sitting down and completing a week. I LOVE these coordinating stickers from the new Family set. I used these cards for the week. I loved the fall colors, perfect for this time of year in Michigan. Leave a comment on what you like about 3L adhesives and we’ll draw a random lucky winner at the end of a week for a fun prize from 3L! Thanks for joining us today for the Simple Stories & 3L Blog Hop. Check back with us tomorrow for more inspiration using 3L products.